Yuli expressed his optimism that the number of government translators will continue to grow both in the Central Government and in the regional governments. 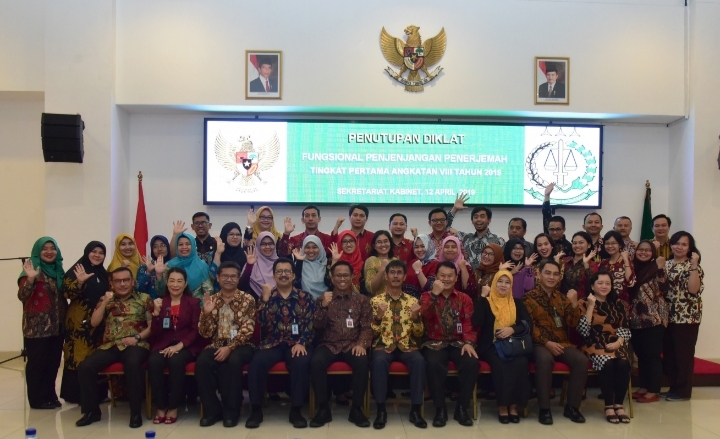 “The increasing number of the government translators shows that more civil servants choose Functional Position of Translator as their career, in line with the strategic role that Indonesia plays on international stage nowadays,” he said. According to Yuli, Cabinet Secretariat has sent the government translators to international conferences, including World Culture Forum (WFP), World Coral Reef Forum (WCRF), Asian African Conference (KAA), Bali Democracy Forum, and the 2018 Annual Meeting of the International Monetary Fund and World Bank Group. “We will continue to send government translators to other international events to increase the participation of the government translators in the future,” he added. For interpreting, according to the Deputy, in 2018 the government translators also involved in several events, including the Speech of the President of the Republic of Indonesia at the inauguration of the International Conference, Table Top Exercise Global Health on 24 October 2018 at the State Palace, Joint Press Conference of President Joko Widodo with Prime Minister of Lao and other events. Yuli added that Cabinet Secretary Pramono Anung has sent letters to several cabinet ministers and heads of government institutions to encourage the appointment of new government translators. “It shows that translators play an important role for government institution, both at the central and regional levels,” he said. The Cabinet Secretary also encourages newly-appointed government translators to support translation activities in regional governments, especially in terms of supporting the development of sister city cooperation with international and regional partners. At the end of his remarks, Yuli called on the government translators to be proud with their job. “Do your jobs with enthusiasm, dedication and consistency. Continue to learn and improve your competence in the field of translating and interpreting, “he concluded. In the meantime, Assistant to Deputy Cabinet Secretary for State Documents and Translation Eko Harnowo said that the functional training also aims to make the government translators to be professional and be able to deal with various types of translation in their respective institutions. Eko added that curriculum of the training was designed by several academics and translation experts, covering theoretical and practical aspects in four fields, namely translating, interpreting, compilation of translation materials, and translating of ancient texts/archives/inscriptions. The first module is written by Dr. Untung Yuwono from the University of Indonesia (on Indonesian Language Proficiency) while the subject on English Proficiency is written by Drs. Faldy Rasyidie, M.Sas., From the National University. The second module is written by the late Prof. Dr. Benny H. Hoed, Prof. Dr. Rahayu S. Hidayat, and Dr. Grace Wiradisastra, M.Ed. from the University of Indonesia, (on Translating); Dra. Diah Kristina, M.A., Ph.D. from Sebelas Maret University (on Interpreting); Dr. Sugeng Hariyanto, S.Pd., M.Pd. from Malang State Polytechnic (on Drafting Translation Materials); and Prof. Dr. Titik Pujiastuti, S.S., M. Hum. From the University of Indonesia (on Transliteration and Translation of Ancient Texts/Ancient Archives/ Inscriptions). Eko went on to say that the training is supported by several instructors who have high competence and long experience in their respective fields, including the academics and practitioners from 19 government and private institutions. The training, he added, was held for six weeks with a total of 271 lesson hours and an average of 10 lesson hours per day. The participants of the trainingalso visited Ministry of Foreign Affairs, the United Nations Information Centre, the National Library, and Antara News Agency. Eko further said that every participant gets three certificates at the end of the training. “First, certificate of First Level Functional Translator Education and Training from the State Administration Agency (LAN); second, Certificate of the UKBI (Indonesian Language Proficiency Test) from the Language and Book Development Agency, Ministry of Education and Culture; and third, Certificate of EPT (English Proficiency Test) from the International Language Institute of the University of Indonesia,” he concluded.